Make leafing a breeze! This transfer-style leaf is easier to handle and apply than traditional leaf, but delivers the same lustrous results. Just place on an adhesive surface and peel back the transfer paper with no waste or mess. It can be combined with regular leaf. Basic instructions are included. It measures 5½" × 5½" (14 cm × 14 cm). Each pack contains 18 sheets. 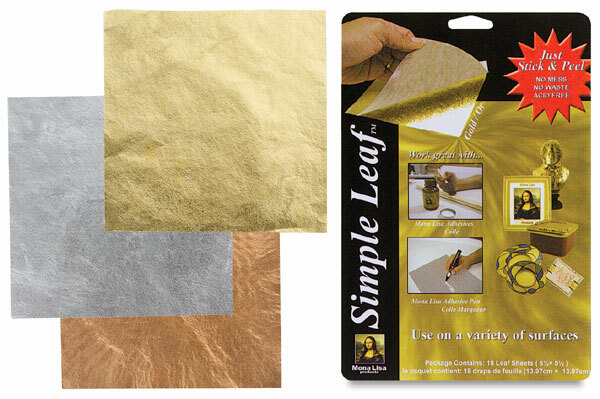 This demonstration shows the basic technique of leafing with a composition gold leaf as well as the easy-to-use Simple Leaf from Mona Lisa. Both are wonderful for a wide variety of fine art and home applications.